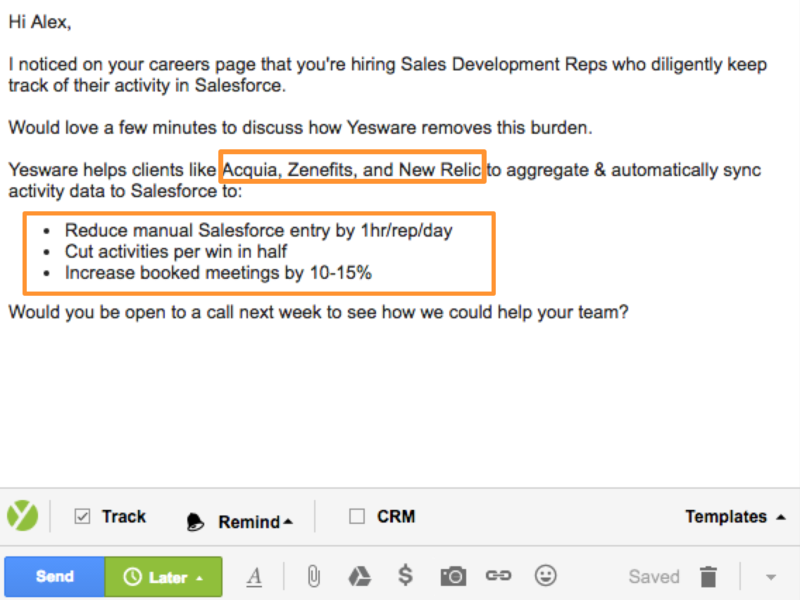 You need to have the right sales techniques in your back pocket to meet a sales quota. These techniques build trust and break down barriers for you. But they aren’t intuitive. You need to practice — and know them in the first place. 71% of sales reps attribute their inability to close deals to a lack of knowledge. So we compiled 7 sales techniques proven to get to “yes,” backed by science. See the best time to send an email with this free interactive tool. When you’re writing a sales email trying to convince a complete stranger to take action, it is important to develop trust and convey value. This strategy is a simple way to turn on persuasion. You use a list of three to convey a main point. It could be three words separated by commas, or more complex phrases sorted by bullets or numbered lists. Identify three pain points your recipient has. List out three end-picture benefits of your product. Mention three of your top customers. See what I did there? It’s a 1-2-3 close in action! It’s the charm of three. People like patterns, and three is the quickest pattern a person can find. A study by UCLA also found three to be the perfect number in settings like sales emails where consumers know that the message source has a persuasion motive. Anything above three sparks skepticism from your prospect. Telling a story is something we all learned to do at a very young age. 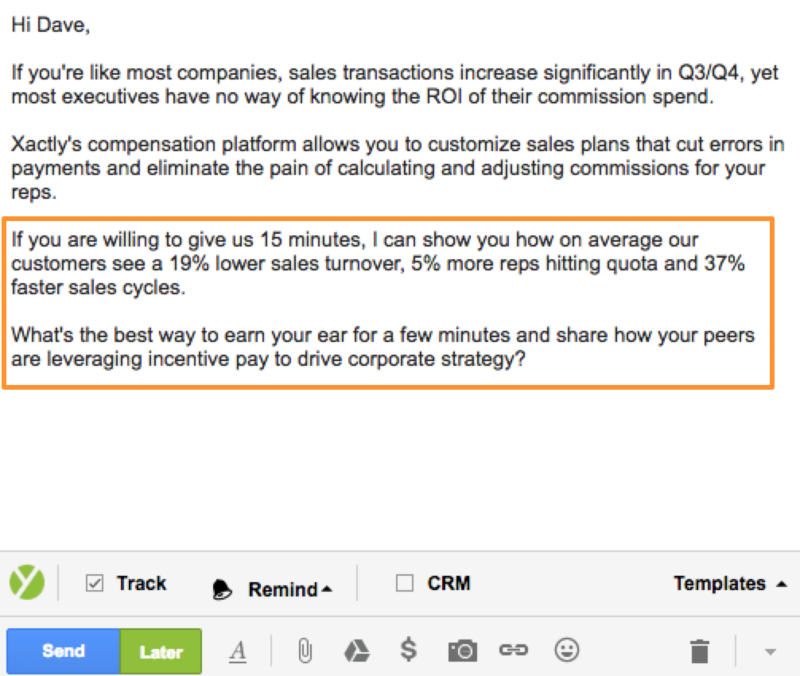 This sales technique takes that skill and applies it to an email. You bring your prospect through a journey similar to their own to show that their challenges are solvable. Identify your prospect’s job title, responsibilities, and industry. Think of a customer contact or account that was in a similar situation. Find one pain point that the customer had that your prospect could relate to. Tell the story in a way that you present the problem and then the solution. Research shows that when we possess characteristics similar to a character in a story, it helps us easily identify with the character and drives persuasion. Happy customers breed new customers. Use this as a sales strategy and show your prospects that your product works for others. It moves from hypothetical language to true results. It transfers the perspective from you touting your own services to a peer validating you. Link out to a written or video customer testimonial for your prospect to see firsthand. Include a customer quote with their company name and job title. Tell a story about a customer using the BAB or PAS formulas. If you do this, make it very clear what the initial problem was, and have a specific role at the customer account validating the metrics that you’re including (check out examples here). According to research, third-party product reviews are 12 times more trusted than product descriptions from the companies themselves. People trust their peers, not vendors with sales motives. 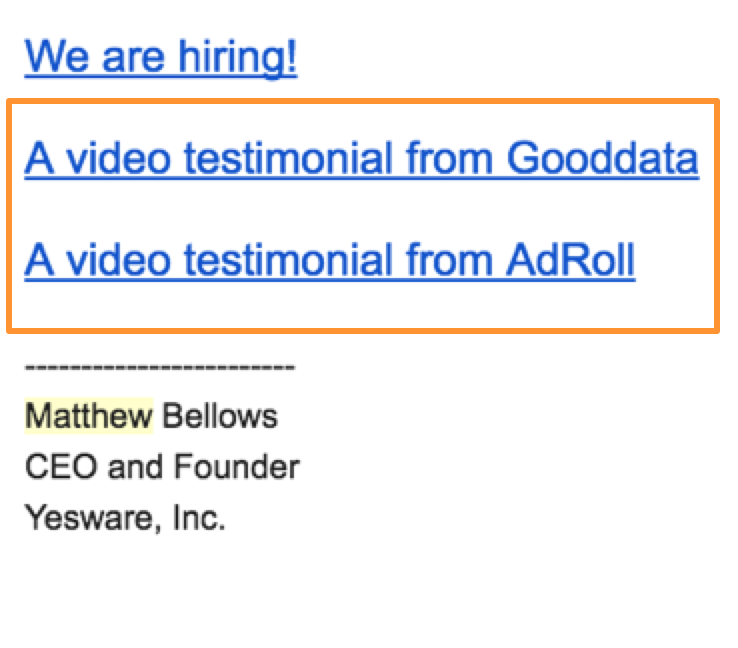 Our CEO and founder Matthew Bellows includes customer testimonials in his email signature. 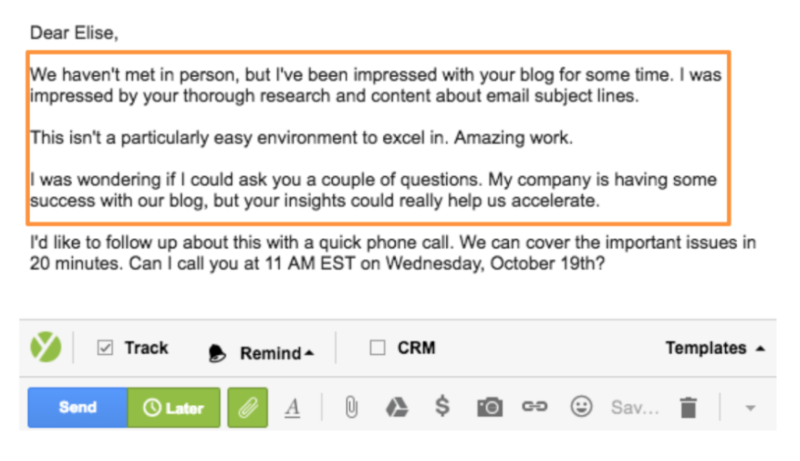 This is an easy way to work the power of the testimonial close into every outgoing email you send, without having to do the work each time. Emotions unify all human beings, so why not appeal to them through the selling process? Instead of relying solely on the facts and figures, take a step back and think about feelings. Look for recent personal or company accomplishments, and send along your congratulations. A recent study indicates that insincere and genuine flattery are equally effective, meaning that if your compliment is forced, it still works to your advantage. Let them know you’re thinking of them by offering articles they would enjoy. Find an uncommon commonality such as having the same birthday, initials, or alma mater. As human beings, we’re driven by emotion. According to Harvard Business School professor Gerald Zaltman, 95% of our purchase decisions take place unconsciously. Emotion is an innate, powerful, and principally unconscious process. The decisions we make are easily persuaded by them. 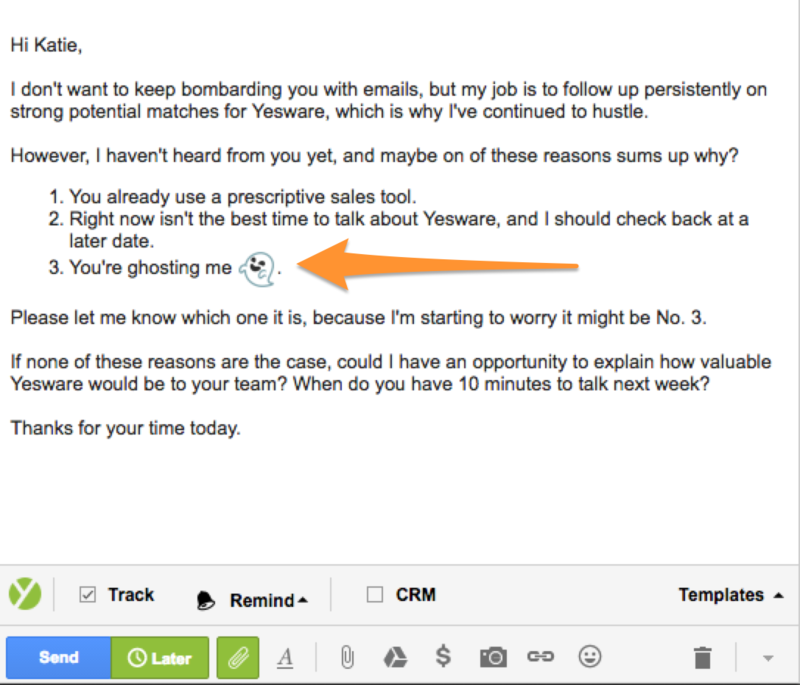 Humor can disarm a prospect who is otherwise turned off by sales emails. Break out from the stale sales techniques that most senders use by showing you have a sense of wit. Chances are you’ll get a smile and reply. Incorporate a funny gif into your email. Do research on a social media account (like Twitter) to find a unique interest or hobby that your prospect has and reference it in a funny way. Use self-deprecating humor to show your awareness to an unpleasant situation (think unanswered emails). It’s simple: Funny people are likable. Humor goes against societal norms or expectations in a subtle way. 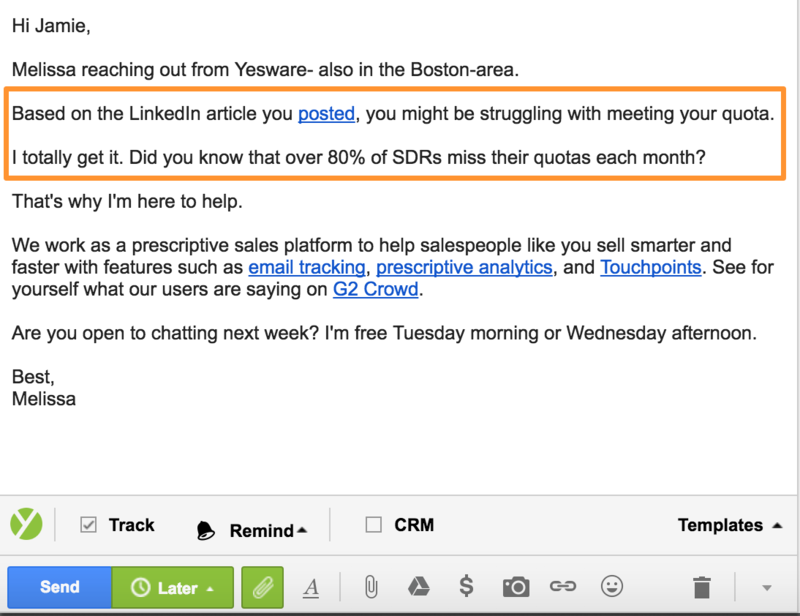 Sales emails are known to make people feel frustrated, put out, and annoyed. Humor has the opposite effect by putting a prospect in a more relaxed mood. Note: Remember to think of your specific target audience before making a joke. Avoid anything offensive or inappropriate. Using Gmail? Try scheduling your email to send when it’s most likely to be opened. Making decisions can be overwhelming. Simplify the process by offering two options for them to choose. List two different times you could schedule a call. Offer a free trial or to schedule a demo. Ask if you should reach out at a later date or simply let it be. Decision-making can be difficult. Whether choosing where to eat dinner, or whether or not to buy your product, people struggle with making certain calls. A study from New York University suggests that restricting choices by limiting options actually enforces more creativity. We are bound to make better decisions by having less options. With less options, we can actually expand our thought processes. Nothing’s more persuasive than being shown that someone understands your point of view. It’s true in sales, politics, and everyday life. If a prospect is hiring for a role your service could eliminate, reach out to show how you can make their situation easier. Suggest ways to solve their problems by researching articles they have shared on LinkedIn. If your competitor is having issues, reach out to your prospects to show that you can assuage their situation. A report from Harvard Business School shows that empathy increases sales persuasion specifically when you show a prospect the utility in what you’re selling. By identifying concerns and going above and beyond to help solve their problems, you’ll earn your prospect’s respect. 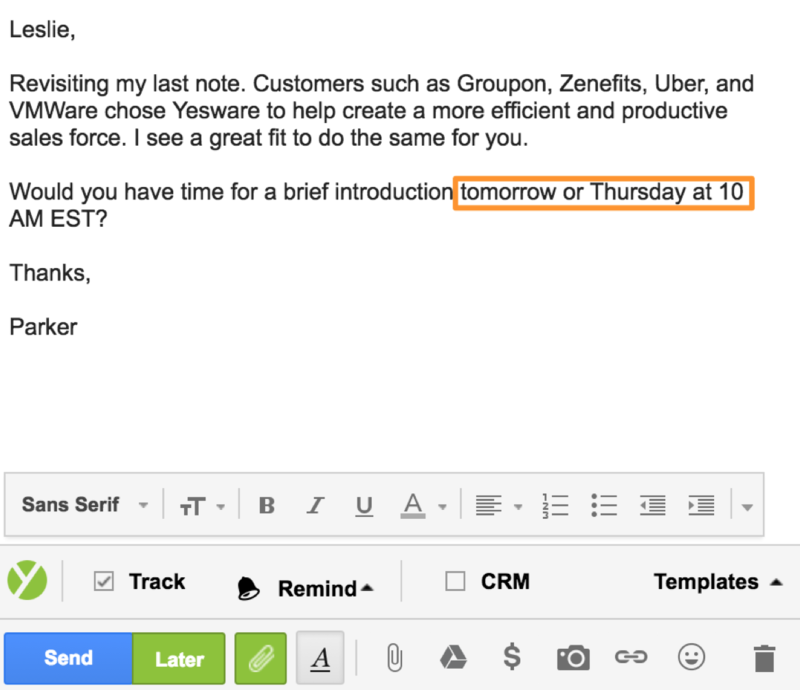 Pair your sales techniques with subject lines that actually work. What are your favorite sales techniques? Tweet @Yesware and let us know!